Includes a printed insert with lyrics and credits. ℗ & © 2016 IGHO, LLC. Tracks A1, A3, A4, B2, B4 published by Top Notch Booty (BMI), administered by BMG Rights Managemenbt & Board Stiff Music (BMI), administered by Songs Of Kobalt Music Publishing. Tracks A2, A5, B1, B3 published by Top Notch Booty (BMI), administered by BMG Rights Managemenbt, Board Stiff Music (BMI), administered by Songs Of Kobalt Music Publishing & Sleeping Disorder Music (BMI), administered by Songs Of Kobalt Music Publishing. Recorded at Rancho De La Luna, Joshua Tree, CA Jan 12-30 2015 and Pink Duck Studios, Burbank, CA Mar 3-9 2015. Mixed at United Recording Studios, Los Angeles, CA May 13-15 2015 except "In The Lobby" mixed at Pink Duck Studios, Burbank, CA July 14 2015. 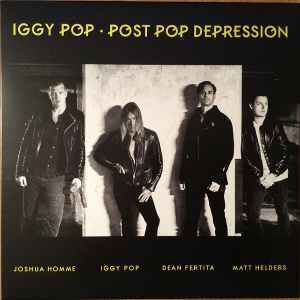 Can't believe no ones commented on this release, it's a really great album and probably my second favorite Iggy album next to New Values.. It's a unique set of songs with an original sound. Very interesting, creative songs featuring Josh Homme playing some amazing licks. As far as the pressing, it's done at Pallas so you know your getting quality. Flat, centered no surface noise, no flaws to the vinyl surface. As far as the sound goes, I don't know if I can accurately grade this because my stylus might be worn but the low end sounds a little muffled. Bass a tad bit hollow. Drums not as punchy as I would like and lacking in separation and clarity. It sounds decent though. Sounds full, spacious and not compressed, so that's a plus. Balanced well. Probably could have benefitted from a better mastering job tho. But honestly if you can get this brand new for under $20 there should be nothing stopping you. Will do for a clean copy to spin.